Sammlung aus 10 verschiedenen Emissionen, für alle gilt: Porto, Acção de 100 Reis (wenn nicht anders erwähnt); a) 12.01.1854; b) 1859, 3,5 % Obligation über 100 Reis; c) 18__, Blankett einer 4 % Obligation über 100$00 Reis; d) 18.04.1877; e) 02.07.1894, Blankett einer 6 % Obligation; f) 02.01.1907, 6 % Obligation; g) ohne Datum, Blankett von f); h) 19.03.1920, 100$00 Escudo; i) 03.05.1897, Blankett; j) 30.05.1905, 6 % Obligation. Herausragendes Lot mit 10 verschiedenen Wertpapieren zwischen 1854 und 1920. Viele der Papiere zeigen die Fabrik oder die dort hergestellten Produkte. Die Auflagen sind meist recht niedrig und die Papiere haben niedrige Seriennummern. 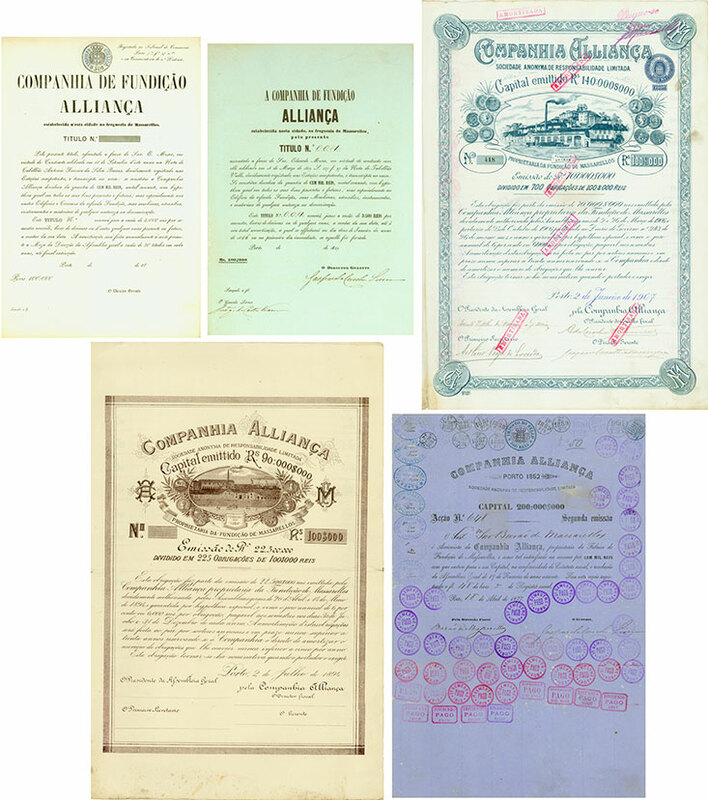 Collection of 10 different issues, all: Porto, Acção de 100 Reis (if not mentioned otherwise); a) 12 January 1854; b) 1859, 3.,5 % Bond for 100 Reis; c) 18__, Unissued Certificate of a 4 % Bond of 100$00 Reis; d) 18 April 1877; e) 2 July 1894, Unissued Certificate of a 6 % Bond; f) 2 January 1907, 6 % Bond; g) no date, unissued certificate of f); h) 19 March 1920, 100$00 Escudo; i) 3 May 1897, unissued; j) 30 May 1905, 6 % Bond. 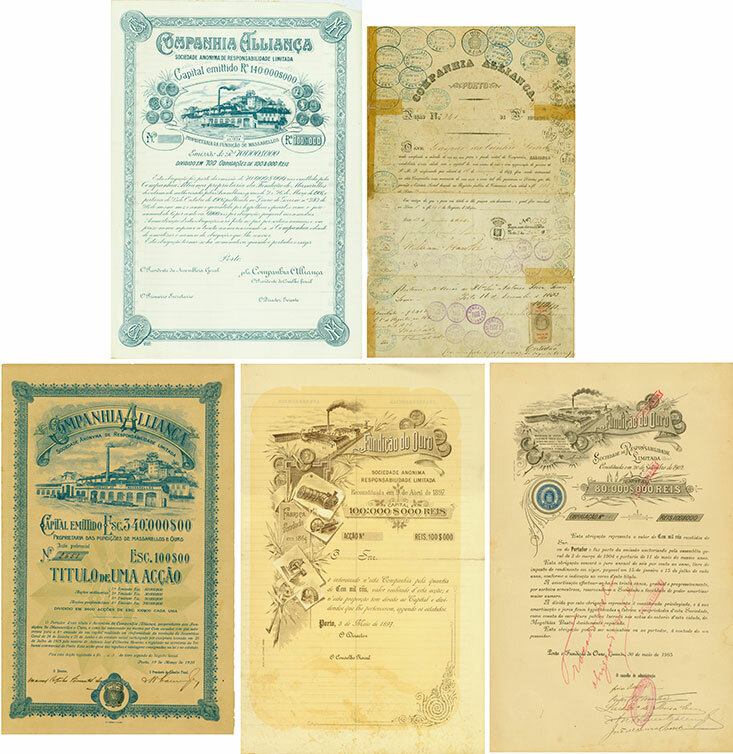 This is an amazing lot of 10 different shares/bonds from 1854 to 1920, many of them with an amazing view of the factory and its products, very low issues and some of them with a very low serial number. In Portugal begann die beschleunigte sich die Industrialisierung im zweiten Drittel des 19. Jahrhunderts. Die metallurgische Industrie wurde in dieser Zeit zu einem der wichtigsten Sektoren. Die Fundição de Massarellos wurde 1849 in Porto als private Partnerschaft zwischen Joaquim Lidoro de Castro, William Hawke und dem Baron von Massarellos gegründet. Anfangs gab es viele Probleme, bis Gaspar da Cunha Lima in die Firma eintrat. Die Fundição de Massarellos kam zur Companhia Alliança. Die Gesellschaft produzierte die für die Branche wichtigen Ausrüstungsgegenstände wie Gußeisenroste, Winden, Pumpen sowie Dampfmaschinen. Luís Ferreira de Sousa Cruz gründete 1864 in Porto die Fundição do Ouro. 1897 wurde die Gesellschaft Teil der Companhia Alliança, die bereits die wichtigste metallurgische Fabrik in Porto besaß, die Fundição de Massarellos. Die Gesellschaft wurde 1975 stillgelegt. Nach 125 Jahren wurde die Fundição do Ouro (Companhia Alliança) Anfang der 1980er-Jahre endgültig stillgelegt. Die Fundição de Massarellos und die Fundição do Ouro waren die zwei wichtigsten metallurgischen Gesellschaften in Porto. In Portugal, the process of industrialization started to intensify from the second third of the 19th century, and the metallurgical industry became one of the most important sectors. The Fundição de Massarellos was founded in Porto in 1849, as a commercial partnership between Joaquim Lidoro de Castro, William Hawke and the Baron of Massarellos, but at the beginning the problems were immense, until Gaspar da Cunha Lima joined the company. From this moment the Fundição de Massarellos became property of the Companhia Alliança. The company has dedicated itself to the production of all the necessary equipment for the industry, such as: cast iron grids, winches, pumps, steam engines of high and low pressure among others. In 1864 was founded in Porto the Fundição do Ouro by Luís Ferreira de Sousa Cruz. Around 1897, it was part of the Companhia Alliança, which already owned the most important metallurgical plant in Porto, the Fundição de Massarellos. In 1975 the Fundição de Massarellos closed its activity and its documentary collection was incorporated in the one of the Fundição do Ouro, since they belong both to the Companhia Alliança. At the beginning of the 1980s, and after 125 years of activity, the Fundição do Ouro (Companhia Alliança) ended the work definitively. The Fundição de Massarellos and the Fundição do Ouro were the two most important metallurgical plants of Porto since 1852.